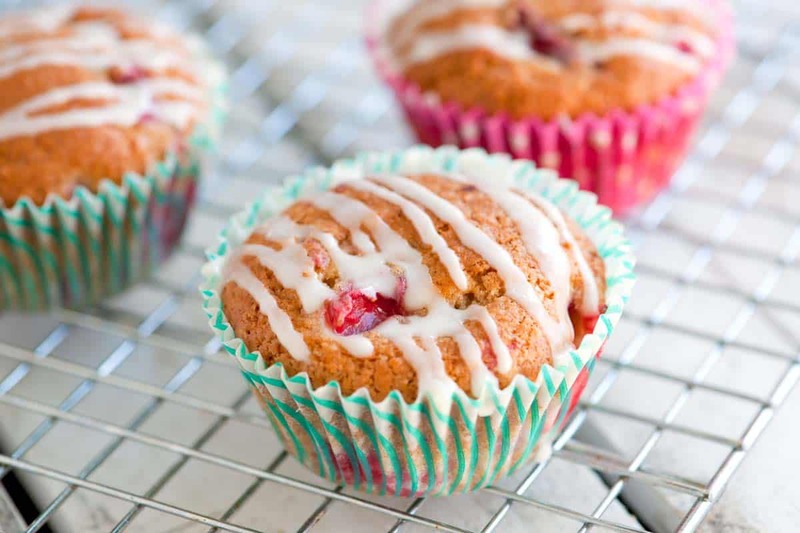 These yogurt muffins come together quickly and are packed with strawberries. When you make muffins, remember this: mix dry ingredients as much as you want, mix wet ingredients as much as you want but, when you put the two together only mix until they combine. If you over mix, the muffins will be heavy and flat. Heat oven to 400 degrees F. Line a muffin pan with paper liners or spray with non-stick cooking spray. In a large mixing bowl, whisk the flour, sugar, baking powder, baking soda, cinnamon, and salt until well blended. In another bowl, whisk the yogurt, egg, and melted butter until smooth. Pour into the bowl with flour and stir with a fork until just combined. Do not over mix. Stir in the strawberries. Fill muffin cups about three-quarters full. Bake muffins until tops are golden brown, no longer wet and a toothpick inserted into the middle comes out with crumbs, not wet batter; 15 to 20 minutes. Transfer to a wire rack and cool completely. To make the vanilla glaze, whisk powdered sugar with vanilla and 1 teaspoon of milk. Continue to add milk until the glaze is thin enough to drizzle over the muffin tops. Drizzle glaze on top of cooled muffins then wait 5 to 10 minutes for it to set. Frozen strawberries: Thaw frozen strawberries then dice. These can be substituted for fresh strawberries in the recipe above. Storing: These are best eaten the same day. Overtime, they loose their crunchy top. We’ve found it best to place them in a plastic bag, seal, and store in the fridge for to 2 to 3 days then warm just before eating. To freeze muffins, wrap them tightly in aluminum foil or place them in freezer bags, and freeze for up to 3 months.